Saudi Arabia's foreign minister said on Sunday that the kingdom had nothing to do with leaking Jeff Bezos' texts to the National Enquirer, and that the whole saga sounds like a "soap opera." In his explosive blog last week, Bezos pointed to links between the National Enquirer and the Saudis, as well as to his own publication the Washington Post's coverage of murdered journalist Jamal Khashoggi. An attorney for AMI — the Enquirer's publisher — also denied that Saudi Arabia had anything to do with the story in an interview with ABC on Sunday. He refused to name the source who handed the texts over to the Enquirer when asked if it was Michael Sanchez, brother to Lauren Sanchez, Jeff Bezos' reported lover. But he let slip that the source is a man who is known to Bezos and Lauren Sanchez. Saudi Arabia's foreign minister told CBS on Sunday that the kingdom had nothing to do with the leaking of Jeff Bezos' intimate texts to the National Enquirer. Bezos published an explosive blog last week accusing US tabloid the National Enquirer of "blackmail and extortion." He mentioned links between Saudi Arabia and Enquirer publisher American Media Inc (AMI), including the story that AMI published a glossy pro-Saudi magazine in March 2018. Bezos also made reference to the story of Jamal Khashoggi, the Washington Post Journalist who was murdered in the Istanbul Saudi consulate last October. Bezos, who owns the Washington Post, wrote: "The Post's essential and unrelenting coverage of the murder of its columnist Jamal Khashoggi is undoubtedly unpopular in certain circles." He also said the head of AMI, David Pecker, was "apoplectic" about Bezos' investigation, and "the Saudi angle seems to hit a particularly sensitive nerve." 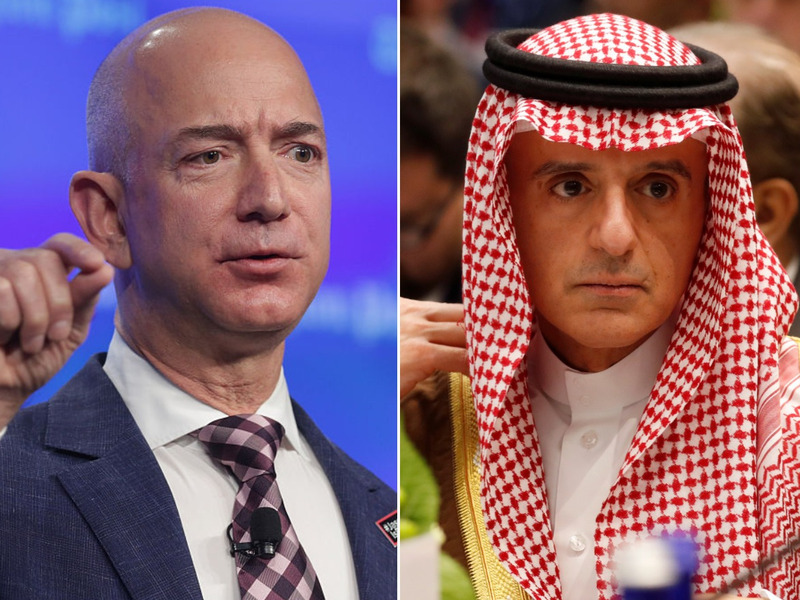 On Sunday, the Saudi Arabia's minister of state for foreign affairs Adel Al-Jubeir denied that the kingdom had any involvement in leaking Bezos' texts to CBS. "This sounds to me like a soap opera. I've been watching it on television and reading about it in the paper. This is something between the two parties. We have nothing to do with it," said Al-Jubeir. On the same day, AMI's attorney Elkan Abramowitz gave an interview to ABC news. In it, he refused to name the source who gave the texts to the Enquirer, but did let slip some details about their identity. He said it was "a reliable source that had been giving information to the National Enquirer for seven years" and that they were "well known to both Mr Bezos and Miss Sanchez." AMI sources told The Daily Beast that the source of the leak was Lauren Sanchez's brother, Michael Sanchez. Although he refused to comment on whether Sanchez was the source, at one point Abramowitz let slip the source's gender. "It was a person that was known to both Bezos and Miss Sanchez, therefore giving his information more credibility," he said. Abramowitz also denied that Saudi Arabia had anything to do with the leak, and said AMI "doesn't have any Saudi Arabian financing."